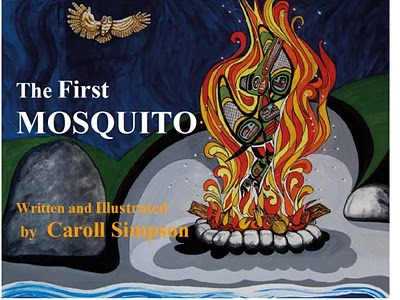 Our BLG book this week was The First Mosquito written and illustrated by Caroll Simpson. Thanks to Bill for reading us this dramatic tale. Student writing reveals how engaging we found this story! Kala: Why did you make the blood sucking monster go to the fire? I like your pictures! But I think they are so real. Shereese: I like when the Mom saved the day! I like the art too. I like Creek woman crouched under the creek. I love those pictures. You are a great artist! Ashley: My favourite part was when the bloodsucking monster turns into mosquitoes The sucking monster seems like he is mean! Kelvin: Bloodsucking monster came to eat their blood. And the bloodsucking monster fell into the fire and turned into one million mosquitoes. Heman: The best part was when the bloodsucking monster went into the fire and transformed into mosquitoes. I liked it when Yax ran away from the man. I was scared when the blood sucking monster ran to the beach. Vicky: My favourite part was when the blood sucking monster transformed into some mosquitoes. I want to know what happens next. Andrew: My favourite part was when the bloodsucking monster went in the fire. What happens when the lightning snake shoots you? What happens now? Ethan: I know why Bill picked this book because it’s almost Chinese New YEar. I like that book. It’s awesome! Kevin: My favourite part was when the blood sucking monster transforms into mosquitoes. Where did the thunder snakes shoot? At who? Brian: You are a good reader Bill. that book was scary. The Mom that push the bloodsucking monster was a super Mom. I felt scared when Yax and Sook was coming to be eaten. This entry was posted in BLG Reads this week and tagged Aboriginal literature, BLG Reads, Caroll Simpson, fiction, great read alouds, picture books by carriegelson. Bookmark the permalink. Thank you Myra! It has been exciting to share these responses. Lately we’ve been having authors reply and the kids get so excited to get a response to their words.